Yo-Ho Yeoman SnoBlade PolarTuff Plow Snow Blade Flip Shovel w/ Wheels. You will not find a finer snow removal shovel on the market. We stand behind this product with our 100% Money Back Guarantee. If you have serious snow to move, look no further than the Polar Tuff Plow! This bi-directional snow blade makes it easy and simple to clear your drive and sidewalk in half the time with half the effort needed for conventional shoveling. 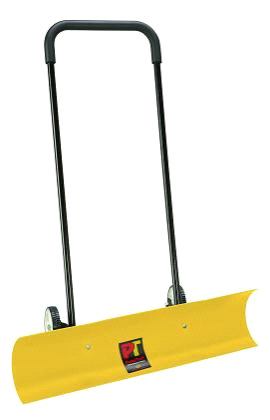 The Yo-Ho Polar Tuff Plow Snowblade simple design is ideal for use at home or at your business. The PolarTuff stores easily and takes up little room in your garage, just hang it on the wall. Call us at (800)355-2956 Toll Free if you have any questions.